Nuts About Shea Butter – The reader will discover shea butter’s benefits, its numerous applications, and how to get optimal use from this healthy and natural nut fat. Learn about the differences between East African and West African shea butter. What is the right kind of shea butter for your needs? Various types of shea butter and shea oil are described in this innovative e-book. Used in African countries for centuries, shea butter has been an ingredient in medicines for the preparation of skin ointments, and to treat inflammation, sunburn, chapping, rashes and more. 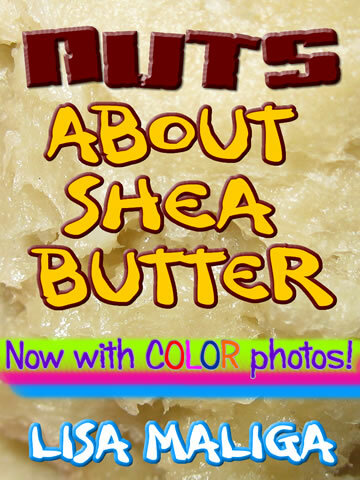 Written for the consumer and the bath & body products crafter, NUTS ABOUT SHEA BUTTER contains fascinating facts and effective explanations. Shea butter is an ancient African beauty secret that is becoming more popular everywhere. This edition includes several color photos, more varieties of shea butter, interviews with shea butter suppliers, and additional shea butter resources. The author has worked with shea butter for more than a decade and named her company after this star ingredient.